I'm finally settled in my apartment on top of the Sugar Maple Inn. My boxes are unpacked, my clothes are hanging in the closets, and I'm loving my new life on Wagtail Mountain. I haven't found the remote control for the TV yet, but Trixie, my Jack Russell Terrier, and Twinkletoes, my calico kitten, must know where it is because they turn the TV on all the time. Trixie and Twinkletoes are double trouble - in a good way. What happened in THE GHOST AND MRS. MEWER wasn't their fault at all. True, the two of them found a body and managed to drag me into a murder, but now that I think about it, they never would have done that if my crazy Aunt Birdie hadn't pulled a fast one on me in the middle of the night. I'm clueless about how to handle that woman! I have to admit that it was pretty exciting to have a team of ghost hunters staying in the inn. They were an interesting bunch. I never gave ghosts much thought before I met them. I didn't expect them to be so scientific and knowledgeable. The problem with ghosts is that it's very hard to prove they are responsible for the odd things that happen. The ghost debunker showed me some very logical reasons for some ghostly occurrences. But some of the scientific rationale to explain away ghosts is as mysterious and unlikely as a ghost! No wonder people are so confused about whether they exist. Wagtail is all decked out for the holidays now. The staff of the Sugar Maple Inn has had a ball decorating trees and hanging pine roping. There are candles in all the windows and the smells from the inn kitchen are just heavenly. We even had a light snow yesterday. I love walking through town after dark. It's like a magical winter wonderland. Lights twinkle everywhere, and there's caroling every night at the big tree in the middle of the pedestrian zone. Dogs even join in the singing, and no one minds if they're a little off key. This is my first Christmas with Trixie and Twinkletoes. They both deserve something very special. Of course, a lot of cool dogs are wearing THE GHOST AND MRS MEWER bandanas, so Trixie already has one of those. And Twinkletoes loves her new Christmas catnip toy! I'll have to think of something else for them. 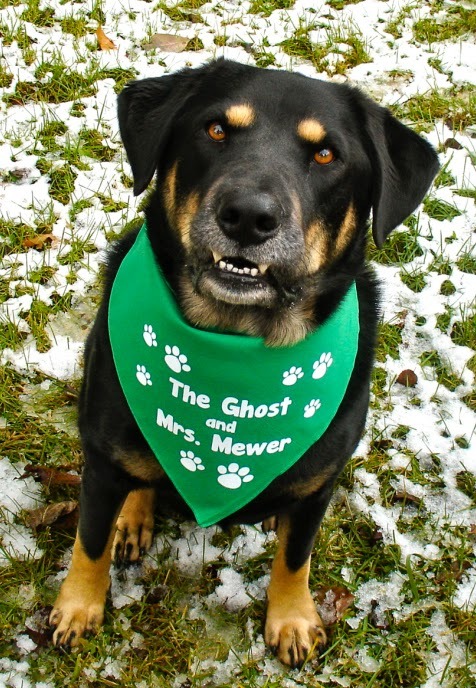 But Krista is giving away a copy of THE GHOST AND MRS. MEWER, a bandana, and a catnip toy. To three different people! To enter just leave a comment telling her which one you would like to win. Good luck and Happy Howlidays to you all! Ghost and Mrs. Mewer. Animals always make the Holidays more enjoyable. My pick would be the book. Merry Christmas. Wow, would love to win the book of course....but I can't be greedy, it's the holidays! So, it's the catnip toy for Echo! Thanks for the chance! Can't resist that title! Would love to see my dog sporting that cute bandana! Thanks!! Although I would dearly love to win the book, my kitty-boy is crazy for catnip toys so I would like to make him happy by winning one for him! I don't have an pets right now so I'll try for the book. My Chloe would love to have a new bandana . I would love to win a copy of The Ghost and Mrs. Mewer. The bandannas are awesome, but I don't think I could get any of my four furry children to wear one. My choice would be the book, love the title. The cat and puppy are so cute. I'd like the book. Bear would like the bandana. I would like the book. I just love this title, always makes me laugh and think of the old movie. I would like a bandana. Thanks for the giveaway. We're having an argument about this at my house. I want the book, but my cats want the catnip toy. If you draw my name, you'll have to settle the argument. Love your book and would love a bandana. 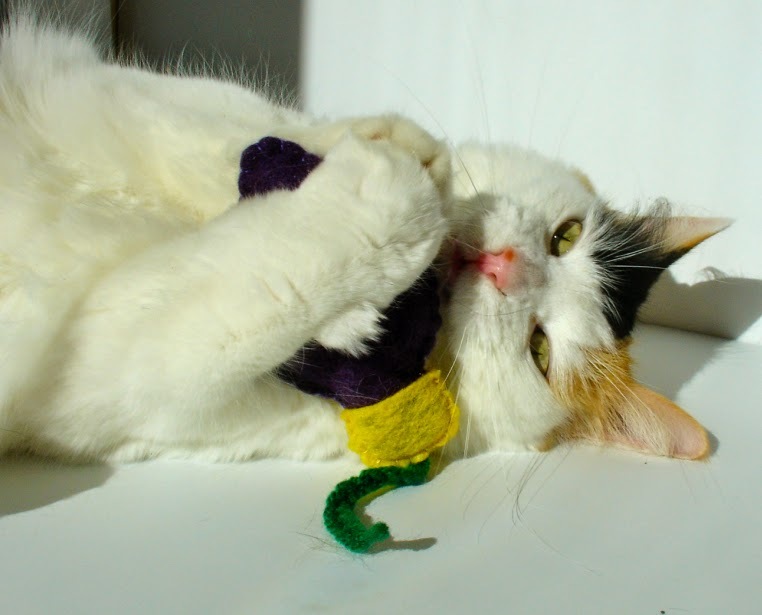 Nothing my Charmee loves more than cat toys (except me!) and I just know that Charley, our new neighbor pup, would love a bandanna. If I get the book I promise to give my 3 cats catnip toys to enjoy while I read! Being an avid reader, the book sounds grand for cuddling up with my dog and a winter fire. To me our home would not be a home without our two fur babies to enjoy. Ralphie Lee and Romeo Luigi provide us with much entertainment and happiness. I would love to have a copy of this book to read while chilling with my boys. I would love to win the book, however the toy or the bandana would be nice too. I loved this book!! Wagtail is the purrfect pet Utopia and all of us pawrents would love to visit(if we couldnt live there permanently). Although the high number of murders is a bit off putting, lol. Tyler would love to win a bandana or his kitty friends would enjoy some cat nip toys too. Cant wait for the next in this amazing cozy series. Thanks Krista Davis for giving us this awesome series!! Just getting back into copies. Love them. Have a dog and 2 cats. We are happy with anything. Louis says he needs a bandana meow. I like books! My cat loves catnip toys! My dog isn't overly jealous so he wouldn't mind the cat getting a new toy. Would love to win. This sounds like a good book and you can never have too many cat toys. My cat has hers stashed all over the place. I would love a copy of your book or atoy for the cat or bandana for the dog. Your choice. I love your books! I loved the first of this series, I'm open to any I would love the book, I haven't had a chance to get it yet. My dog is telling me "no" the bandana, my cats are chiming in with the catnip toy...I just fed them...as I requested the book, LOL. I would love a copy of the book! I'm trying to get into the holiday spirit myself here though I have horrible cold. At least I can appreciate the lights outside from my view from the couch! I would love the book. Love, love, love your work!! Thank you and happy holidays!! Krista I'd kill for the dead tree version of the book. We have no furrkids since we are both deathly allergic. Our nieces have cats and always make sure they are fur and dander free before visiting. I love Christmas with my furkids. Mariusz had his picture taken with Santa-this is his first Christmas and he's doing very well with the (live) Christmas tree. It has lights, but no decorations this year...just in case. He and the other cats would love a catnip mouse. I love my furbabies. My cats love laying under the Christmas tree. Would love to win a copy of the book. I love your Diva series and haven't had a chance to read the new series yet. Thanks for the chance. Thanks for a chance----would love a bandana. My cats love toys. Meow! 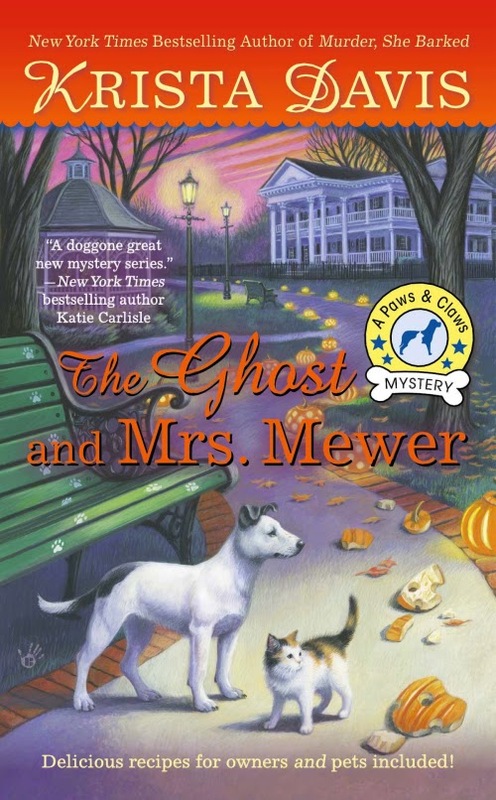 I would love to win "THE GHOST AND MRS. MEWER"! Thanks for the chance! 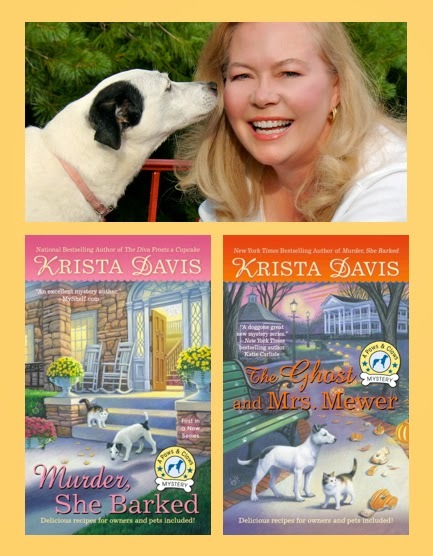 I would love to win "The Ghost and Mrs. Mewer"! Thanks for the giveaway! I would love the book or the cat toy. I am afraid I have a serious fear of cats. I am a dog person. I lost my Corgi, Shelby, about five weeks ago. I miss her very much, especially in the mornings, which was our special time together. I would love to win a copy of the book. I enjoy reading both of your series. I . Would Love to get the book because I have enjoyed everything I have read of yours. You write well and your characters draw me in. Thank you for this opportunity to win. I would love to win the book! I also have a Dog and Cat so I would love for them to win 2! You decide either way we will all be happy! Thanks for the chance! As much as I would like to win the book....okay...I'd love it. I have two cats one a former foster cat and the other a former cat of the streets. They would be delighted with a catnip toy. Since I should be thinking of others this Christmas, I have to think of them. Who can deny them? :) Thank you for the chance. The book first or the cat toy - love this cover too!! The book or the cat toy would be amazing. This series sounds really good with that touch of funny the best series have. I would love either one! I haven't read any (yet!). I would like the book, please. Unfortunately, I'm allergic to both cats and dogs, so I have no pets. The books sound delightful and my cats would love a toy. My new rescue cat would love a new catnip toy. I love this series. Its so fun and creative. Thank you for the opportunity. I love the Domestic Diva series, so I'd love to win a book in this series. Such wonderful books. Thank you for all of your work. My cats would really appreciate a new toy. Have a blessed Christmas. I would love to win the book but I would be happy with any prize. Thank you so much. Thank you for the give away to make a Merry Christmas for some of your readers. I'm looking forward to your next book. The Ghost and Mrs. Mewer...please...I would love to start reading in this series. Hope I win this book. Thank you.